‚A journey through time‘ is the title of the new RIMOWA lookbook and an invitation to visit an era long since passed, but one which saw some major milestones in the development of the company. A collaboration with Brazilian supermodel Alessandra Ambrosia and German male model Johannes Huebl resulted in an impressive collection of photos that showcase the luggage with the grooves yet also stand out in their own right. 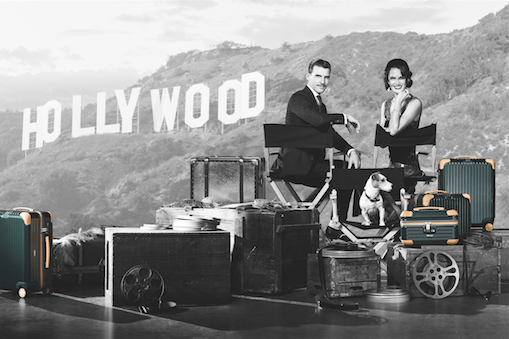 Under the direction of RIMOWA President & CEO Dieter Morszeck, the elegant suitcases were arranged on location in New York by photographer Horst Diekgerdes alongside sophisticated evening dresses and even a dog called Higgins. The results speak for themselves. The pictures can be seen as part of an advertising campaign that will run until the end of 2016 and they also appear in the hardback lookbook on display in RIMOWA stores.